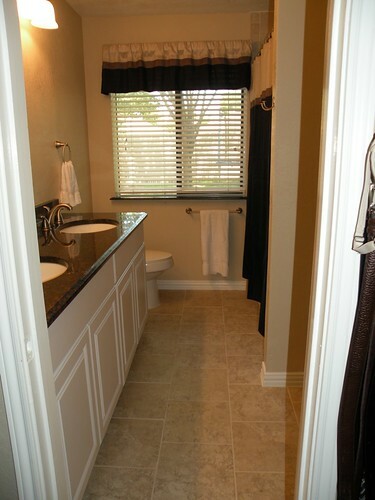 I just added my Mater Bathroom Renovation to HGTV’s Rate My Space! If you don’t remember, or weren’t around back when I made my very first post, you may have missed my Master Bathroom Renovation. In a nutshell, I renovated my Master Bath in my old house I use to live in. I did most of the work, demolition, and instillation myself, but hubby did help when he was available. I’m so super proud of this bathroom. It’s the first huge renovation I ever tacked and I still can’t believe I actually did everything myself! And then one more before and after set. So, anyway, if you are bored and want to check it out, you can see it at Rate My Space! Is it totally inappropriate for me to ask how much your renovation cost?!!? I have 3 bathrooms that I’d like to redo but I never even get serious about it because I just assume I couldn’t afford to do it. Yours is gorgeous…and competely inspiring. Like everything else you do. Wow your a master! It’s totally fabulous!! BTW, your remodel looks FANTASTIC! ‘Got your email re: my laminate furniture. Thanks so much for taking the time to write and for the tips! I will be sure to send you photos when I’m finished. You did a fabulous job on your bathroom!! Oh my GOSH! 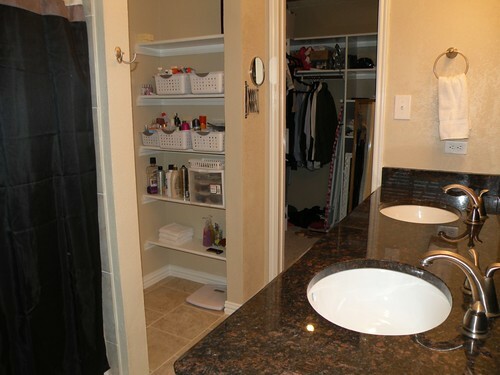 The before and afters don’t even look like the same bathroom! 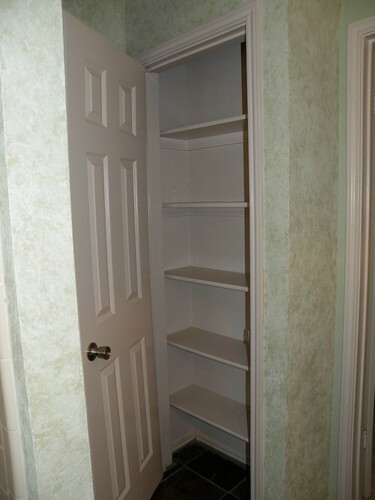 Your renovations are amazing:) Enjoy your new space! 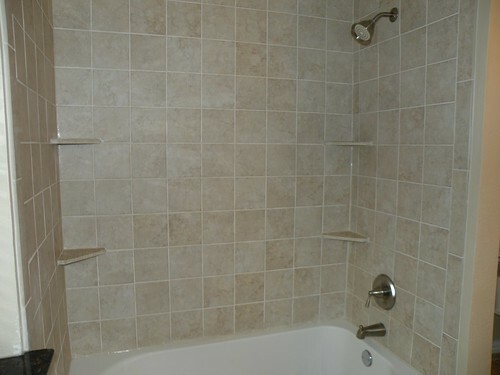 Oh, your bathroom looks wonderful! I know you’re enjoying it so much. Ruth said, “Is it totally inappropriate for me to ask how much your renovation cost?!!? I have 3 bathrooms that I’d like to redo but I never even get serious about it because I just assume I couldn’t afford to do it. No, it’s not inappropriate. I was going to answer quicker but I was trying to figure out how much we spent. Not sure honestly. Oops. 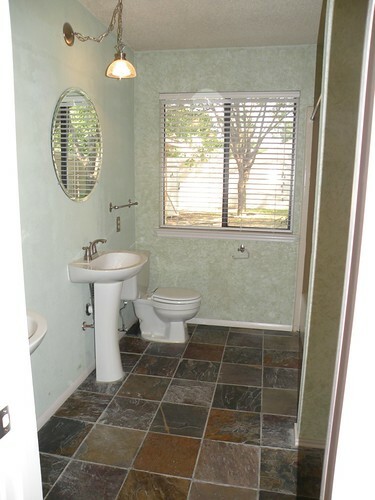 The tile was about $150, the tub was $200, the toilet was about $80(? ), the counter tops and sinks were $950, the cabinets were about $130 each (there are two of them), mirror was from craigslist for $25, the sink fixtures were about $100 each, the light fixtures were from Costco for $35 each, and then all the supplies on top of that like cement board, spackling, etc was probably an additional $200 or so. How much is all that? That totals to $2135, but I’m sure there were additional costs on top, so I’d say I did it for myself for around $2500, maybe $3k at the very most. Cool! Hope you get a high score! Thanks for linking up to Mad Skills Monday! Hey Allison, I’m visiting from Cheri’s. I can’t believe how you transformed that bathroom. You’re amazing! Beautiful remodel. I’ve tiled two shower surrounds now and appreciate how much work that is. It looks professional. Great job. What a makeover! I bet you are enjoying your new space. I am in the process of finishing up our master bath makeover myself. Working on the final touches! Congrats on a job well done! WOW! That is really impressive! I can’t believe that you did most of it yourself!! Nice work! This is UNREAL!! Holy crap! AMAZING!!! You did a fabulous job – I love it! The new bathroom is GORGEOUS!! Talk about a big job! Oh wow! 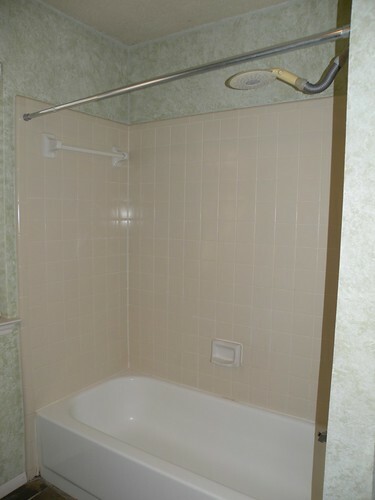 You could have a future in bathroom makeovers if you wanted. Amazing before and after! Thanks for linking to A Crafty Soiree! Love the renovation. I have two baths in desperate need of a transformation. Too little time to worry about that now.